I am posting you a copy of the book which was inspired by your investigation of James Craven, “We will remember them….the men from Eglwysbach and Llansanffraid who served in the Great War”. We started with 22 names on the memorial by our church gates at St Martin’s and expanded to include the neighbouring village and then we found a Roll of Honour and two British Legion lists and ended up with almost 200 men. I must say that it was a challenge, because although I looked up 16 James Cravens myself, that was a doddle compared to trying to find the right Hugh Hughes in the Royal Welsh Fusiliers (I never found him in fact, because he died after the CWWG finished collecting names, but before our Memorial was put up in 1923 and his records were destroyed)….not to mention all the Thomas Williamses and David Joneses! When I proof read the book through, I realised that I had actually missed out two of the biographies, even though I had double checked the names against the Memorial lists, simply because there were other men with the same name…..some anxious jiggling of pages resulted. Anyway, the day of the window unveiling was incredibly special for me and I am so grateful to you that we can now honour the men from here as well. Strangely enough when I was in the printers collecting the book, a random lady whom I did not know walked in and when she saw me dancing around with the book (I was just a bit excited) she saw the title and we found her great uncle in it. 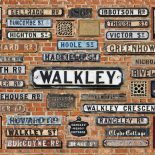 I am still in touch with the relatives you found for me and Hilary Bull sent me a copy of Walkley Ways, which I am passing around the cousins. This entry was posted on May 23, 2016 by Bill Bevan in First World War, News.